Hawkeye is a great character to use for a solo title. In a team with Captain America, Iron Man and Thor, what's a guy with a bow and arrow really gonna do? This why he makes much more sense as a solo act. Despite the questionable costume choices over the decades, he's still a good character to follow. For a reformed criminal, he's got a decent moral compass, even if his attitude isn't always exemplary. He may not be a hero's hero, but he knows what he believes in and he sticks to it. His methods may not make him a boy scout like Captain America, but they get the job done without a whole lot of collateral damage. This seems to be a good start for a solo series, but I can definitely see more being done with it. He's a versatile character and the issue does a good job of showing us that. 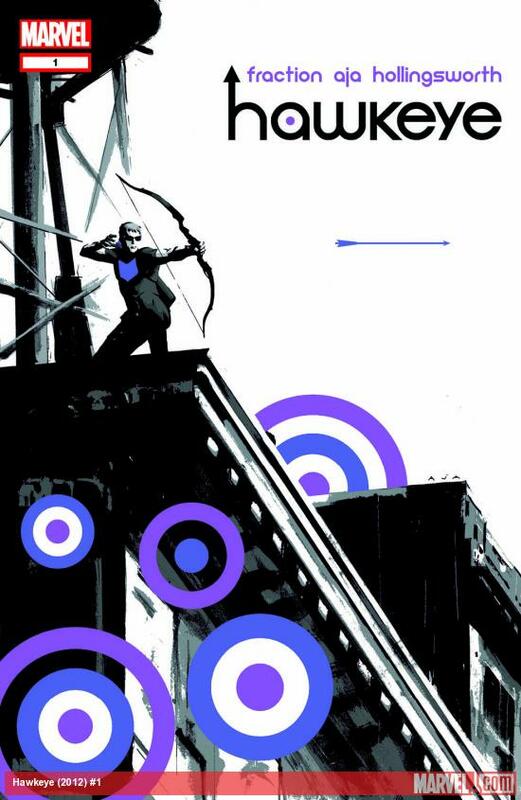 Despite his last name making him sound like The Calculator's sidekick, Matt Fraction has just captured my attention with this first issue of Hawkeye's solo series. Pitting Clint Barton against Russian mob wannabe's was a great way to show what he cares about. Not your run of the mill superhero story, it's very different. In this industry, a good kind of different is hard to come by, so my hat's off to Mr. Fraction. He's started the series off by making Hawkeye very real, breakable, resilient and truly heroic. Making an Avenger seem human is a tricky thing and he's done a splendid job. The story flows like water, showing off several sides of the card-carrying Avenger. David Aja and Matt Hollingsworth have done a good job as the artist and colorist, respectively. Aja's work reminds me of Darwyn Cooke's Justice League: New Frontier without trying to be. It's simple and elegant, which is exactly what a story about Hawkeye should be. It shows just how awesome Hawkeye is on his own without distracting from the story. Hollingsworth's muted colors are a great fit with Aja's pencils and inks. Their work fits together as if each guy's style were tailor-made to work in sync with the other's. Aja's panels and visual story-telling fit with Fraction's story quite well and make it seem like a tiny graphic novel. I didn't go into this thinking I'd enjoy it but it earns an A, which is pretty good for a first issue. I recommend it to any Avenger fans. Just moved to Wisconsin, in a 9,000 population town. I’ll definitely have to be looking up my local store at comicshoplocator.com soon for this one.